Tutoring Futures offer a private tutoring solution, tailored to meet the precise educational requirements of your children and to complement your family's lifestyle. We provide a bespoke service through detailed consultation, recruitment and placement of high quality live-in tutors and substantial part-time appointments. Our tutoring service offers an educational solution where patterns of life make mainstream schooling unsuitable or where additional support is required. Children may be disrupted through travel or work, have specific educational needs, language barriers to learning, or you may adhere to a particular educational philosophy; we provide experienced private tutors to meet these challenges. "Our clients are looking for a company who devote time to work with them, understand their educational requirements and commit to placing the right tutor for their child. 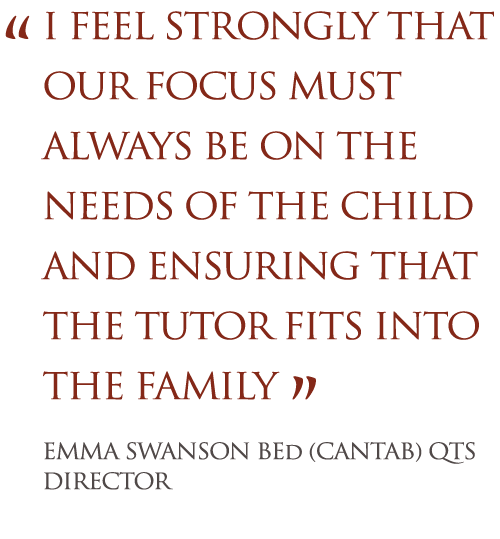 With two young children of my own and over a decade of teaching experience and school senior management expertise, I feel strongly that our focus must always be on the needs of the child and ensuring that the tutor fits into the family."